A rising tide of Darkness threatens the extinction of all things dignified upon Earth, for Evil is (and always has been) about the business of fully corrupting humanity into its own likeness. This dark and unrelenting focus is pursued by Hell because of its thorough hatred of the image of God in us, and so to repel such an onslaught we must first understand the image of God and why it is worth defending with every last ounce of courage and strength we can muster. 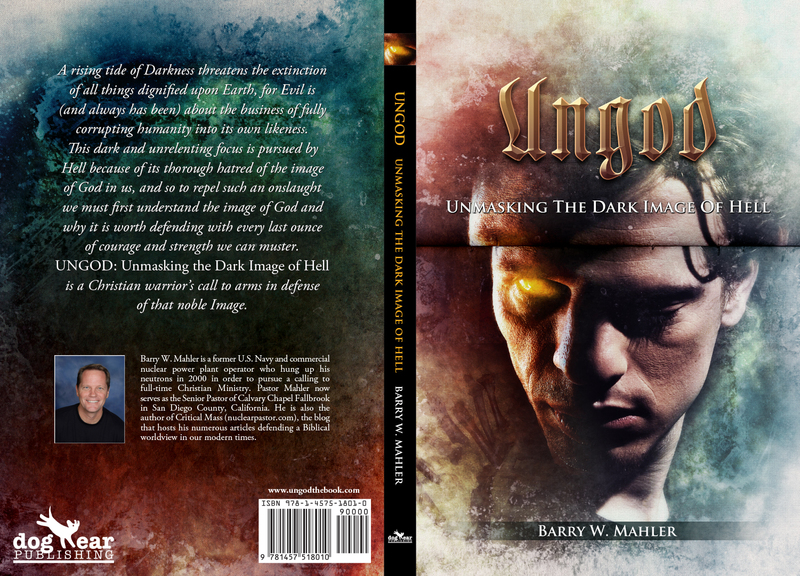 UNGOD: Unmasking the Dark Image of Hell is a Christian warrior’s call to arms in defense of that noble Image. Beginning in Boot Camp, the reader is enlisted into the titanic struggle of the Image War, where the worldviews of Heaven and Hell are exposed and openly clash over the image of God in humanity, and where humanity decides if it will attempt to attain the wondrous and civilized heights for which it was created. By V-Day the reader will be a stalwart veteran left standing before the very gates of Hell itself – fierce, battle-tested and feared by Evil. But to get there he or she must survive the many difficult and vicious battlefields where the Image Bearer comes face-to-face with the naked reality of Evil and its designs upon the individual, the family, human society and human government. By coupling the plainly-taught Scriptures with the human ability to reason, Pastor Barry Mahler has written an engaging, sobering and uplifting summary of the most majestic and dangerous thing in all of Creation – the image of God in humanity, and what the extinction of that image portends for Earth. Above all, UNGOD is a warning of epic proportions, for humanity races toward oblivion at breakneck speeds, giving little thought to its course or ultimate destination. But UNGOD is also an encouragement of epic proportions, for it reminds us of those deep things which lift the inherently noble brow of humanity upward toward Him whose image we still bear. Will you join the fight? Barry W. Mahler is a former U.S. Navy and commercial nuclear power plant operator who hung up his neutrons in 2000 in order to pursue a calling to full-time Christian ministry. Pastor Mahler now serves as the Senior Pastor of Calvary Chapel Fallbrook in San Diego County, California. He is also the author of Critical Mass (www.nuclearpastor.com), the popular blog that hosts his numerous articles defending a Biblical worldview in our modern times.